Reentry vehicle portion of Chang'e-5. The craft made an 8-day flight to loop around the Moon and return to Earth. The reentry vehicle separated from the main bus at 21:53 GMT and landed north of Hohhot at 22:42 GMT. Technology satellite built by CAST, China. Launched 2014. Used the DFH-3A Bus bus. Status: Operational 2014. First Launch: 2014-10-23. Last Launch: 2014-10-23. Number: 1 . Apogee: 404,729 km (251,486 mi). Chang'e-5 RRFV - . Payload: CHANG E 5-T1. Nation: China. Class: Moon. Type: Lunar probe. Spacecraft Bus: DFH-3. Spacecraft: Chang'e-5 RRFV. Decay Date: 2014-10-31 . USAF Sat Cat: 40283 . COSPAR: 2014-065A. Apogee: 404,729 km (251,486 mi). Perigee: -1,281 km (-1,281 mi). Inclination: 30.50 deg. Reentry vehicle portion of Chang'e-5. The craft made an 8-day flight to loop around the Moon and return to Earth. 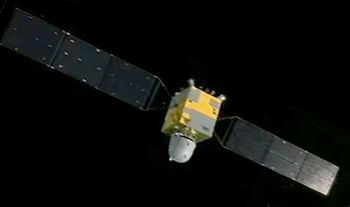 The reentry vehicle separated from the main bus at 21:53 GMT and landed north of Hohhot at 22:42 GMT..